U.S. health plans are seeing a shift in drug costs from payers to manufacturers and patients and co-pay accumulator programs are responsible. These programs have emerged over the past few years, but have become much more common throughout 2018. Also known as accumulator adjustments, co-pay accumulator programs no longer count a drugmaker’s payments for specialty drugs toward patients’ deductibles, limiting the financial assistance provided by drug manufacturers in recent years. According to Adam J. Fein, Ph.D., the CEO of Drug Channels Institute, “Normally, a manufacturer’s payments from a copay program count toward a patient’s deductible and annual out-of-pocket maximum. Once these annual limits are reached, the plan pays for all subsequent prescriptions.” Accumulator adjustments make it harder for patients to reach these annual limits. For example, Accutane, a medication for cystic acne, can cost a patient hundreds of dollars a month. Traditionally, a coupon or discount from the manufacturer would make the medication more affordable and the discount would be applied to the patient’s health insurance deductible, helping reach the patient’s out-of-pocket limit sooner. With accumulator adjustments, the discount is not applied to the deductible. Co-pay accumulator programs were introduced by pharmacy benefits managers (PBMs) to help lower the cost for drugs for payers. According to a recent article, “These adjustments shift more of the drug costs from payers, or health insurance companies and pharmacy-benefit managers, to drug manufacturers and patients.” This shift of financial burden to manufacturers has led to falling drug prices. “For years, manufacturers’ copay programs have helped patients deal with health plans’ and employers’ massive cost-shifting for specialty drug costs,” says Dr. Fein. As specialty drugs become more expensive for patients, there is a greater chance patients won’t be able to afford specialty drugs or they may even forego the treatment. 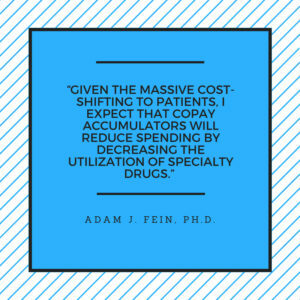 As drug spending drops, Dr. Fein predicts that “Given the massive cost-shifting to patients, I expect that copay accumulators will reduce spending by decreasing the utilization of specialty drugs.” Co-pay accumulator programs have certainly reduced the price of specialty drugs, whether that benefits consumers or not. Decode the impact of co-pay accumulator programs at the 10th Annual Managed Markets and Account Management Strategies Conference on September 12-13 in San Antonio, TX. Dive deep into understanding the shift in risk and overall patient access with Steven Pitts, Senior Director of Corporate Accounts at Jazz Pharmaceuticals. Download the full program agenda today to learn about more and don’t forget to reserve your spot today!